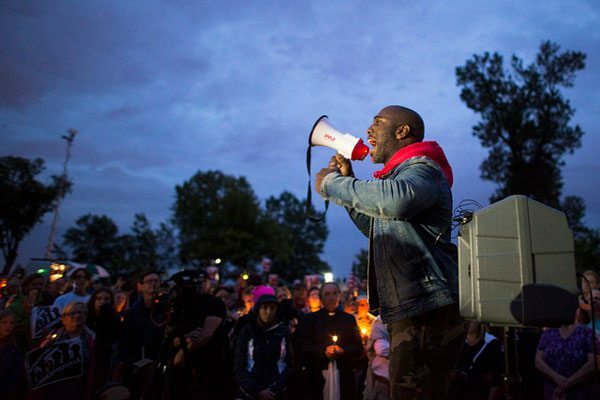 “Speaker at a vigil for Charlottesville, Minneapolis, Minnesota.” Credit: Fibonacci Blue. The white supremacist “Unite the Right” rally in Charlottesville, Virginia over the weekend began and ended with the kind of racial violence that should be impossible for people of the United States and any organizations based on or supportive of the basic principles of human rights, justice, and equality to tolerate. Starting with a torchlight march replete with chants of “White Lives Matter,” “You will not replace us,” “Jews will not replace us,” and open Nazi iconography, it progressed through the next day when a young man horrifically launched his car into a crowd of Black Lives Matter counterprotesters, killing one young woman and injuring many others. Following the violence, which did not end there, President Trump issued a statement so equivocal it stood out as clear refusal to condemn openly and violently racist ideologies. It attributed the “hatred, bigotry and violence” to “many sides” instead of making the point that white supremacy has no place in American society. We could have used a strong statement like that from the White House. Instead, Trump refused to answer when a reporter asked him if he wanted the support of white nationalists. Indeed, many Unite the Right demonstrators wore the “Make America Great Again” hats the Trump campaign popularized. Nonprofits should understand that this moment defines us on a deep level—a moment where civil society must declare with moral certainty that notions of racial superiority are antithetical to our common humanity and our future. As a sector, we have not taken the leadership on this that we should. In fact, our organizations often mirror the distortions of larger society. Not only must we publicly disavow white supremacy; we must offer a counter narrative, and model leadership that supports racial justice and economic justice—in society at large and in our organizations. We have no time to waste.